"Grilled cheese curds are very popular in the northeast beaches. Arrange the skewers on a tray or large platter." Cook queijo coalho cheese and pineapple on the preheated grill until browned, 5 to 10 minutes. Transfer to a plate; cool until easily handled. 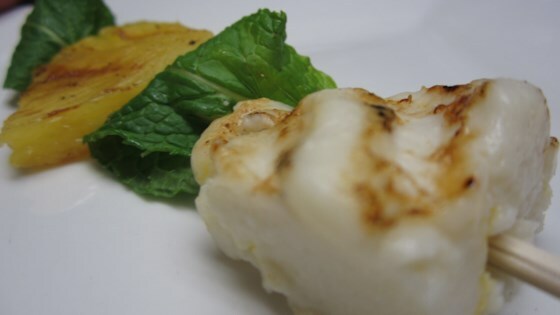 Cut grilled queijo coalho cheese and pineapple into cubes with a sharp knife; transfer to a bowl. Add brown sugar and toss until coated. Stick 1 cube of queijo coalho cheese, 1 mint leaf, and 1 cube of pineapple onto a toothpick; repeat until all ingredients are skewered.